With freelance work becoming more and more popular each year, we have begun to see an influx of issues with businesses misclassifying their employees as contractors in order to save on their taxes. The cost of doing this can be massive, with some companies owing millions depending on how severe the situation was. And, of course, many companies have begun to face class action lawsuits as a result. Today, we are going to cover some of the potential consequences that can come with misclassifying a worker as a contractor when they are really an employee. While this list does not include every possible outcome, it should give you a good idea as to why your business should be ensuring that each person is properly classified. A contractor cannot work overtime, and therefore, companies do not owe contractors any overtime wages. However, employers who fail to pay overtime to employees who have been misclassified will be held liable for neglecting to pay these wages. The statute of limitations under the Fair Labor Standards Act is three years for a willful violation and two years for a non-willful violation. If the employer knowingly violates the law, this is considered willful. Not only are companies held liable for back wages, but they may also face criminal penalties. The Labor Department does not take these things lightly! This liability could mean huge penalties, repaying unpaid overtime costs, and paying and minimum wage deficits. Of course, filing employees as contractors instead of granting them employee status means that a company has not withheld taxes. There may be penalties for not withholding state and federal payroll taxes that could including failure to match Social Security and Medicare tax payments. 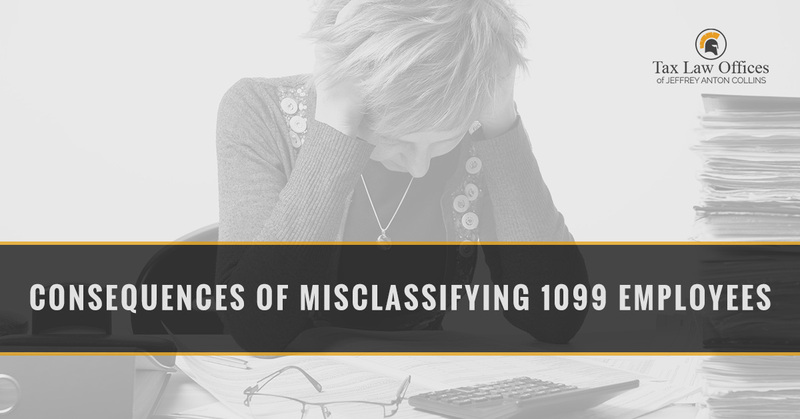 Employers are required to keep I-9s for all employees, including common law employees who have been misclassified as independent contractors. The Department of Labor is much more likely to target specific industries where labor has not historically been that controlled, including home health care, construction, warehousing, and poultry processing. If a business has not paid the amount owed to the state unemployment insurance funds, this amount can be considered retroactive. This problem happens when the employer falsely submits the number of employees because that report determines what the contribution rate is based on. Some businesses file employees as independent contractors so as to not enroll them in a benefits plan. This is a severe issue and opens the door for a number of lawsuits. The liability on this can be tremendous. While there are many problems that can come with misclassifying employees as independent contractors, one major issue is taxes. If an employee contacts the IRS and informs them of the mistake, the business will be subject to an audit going back several years. If you have found yourself in need of legal counsel when it comes to tax dilemmas, contact Tax Law Offices today! Our IRS tax attorneys would be happy to guide you and represent you if needed.